The Old Maddox home, at 2929 Main street, recently converted into a maternity hospital known as "the Willows" was damaged by fire about 7 o'clock this morning. The roof was burned and the upper part of the house was wrecked. Twenty women patients, nine infants, seven nurses and Mr. and Mrs. E. P. Haworth, superintendent and matron, were in the building. Nearly all of them asleep when the fire was discovered by one of the nurses. She detected the odor of smoke in an upstairs room and learned that it came from the attic. For a time the fire smoldered in mattresses and bedding before it broke into flames. The firemen arrived, however, before all the patients were out. Six women were carried out by firemen. Mr. Haworth, aided by neighbors, carried out all of the babies first. The infants and their mothers were taken to another house, an annex of the hospital. The cause of the fire was not determined by Edward Trickett, fire warden, who made an investigation. It started in the northwest corner of the attic, where several mattresses stuffed with excelsior were stored. Mice and matched was the theory of Alexander Henderson, assistant fire chief. The Maddox homestead was built 32 years ago by Asa Maddox, a pioneer lumberman of Kansas City. There were five acres in the original tract on which the house was built. 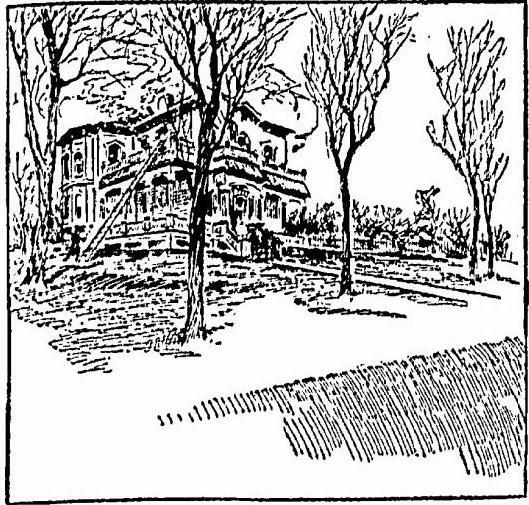 The house was on a high bluff overlooking the Westport road, called Grand boulevard in the early days. Asa Maddox died there fifteen years ago. Mrs. Maddox and her children occupied the home until ten days ago, when the property was sold to the hospital owners. Thursday, April 10, 1913 The Chillicothe Constitution Chillicothe, Missouri FOR PROTECTION TO THE ERRING GIRLS A BAN UPON DECEPTIVE ADVERTISING BY MATERNITY HOMES IS ASKED Kansas City Is Becoming A Clearing House For Nameless Babies, Dr. Castelaw Told Board. Deceptive advertising circulated by maternity homes has made Kansas City a clearing house for nameless babies, Dr. R. E. Castelaw, superintendent of the General Hospital, told the hospital and health board yesterday afternoon, says the Kansas City Times. "At least twenty-five girls reach the General Hospital each year," he said, "as a direct result of this misleading advertising matter. They stay at a private maternity home until their funds are exhausted. Then they became city charges. "Last year it cost the General Hospital at least $1,000 to take care of the cases attracted here by advertisements and turned out of the sanitariums when their money was exhausted. In addition, most of them were furnished transportation home by the Provident Association." Doctor Castelaw's statement followed the reading of the investigative committee's report on the Willows Maternity Sanitarium, 2029 Main Street. That report, signed by Jacob Billikopf, Dr. Franklin E. Pearce and Mrs. E. W. Schaucler, accused the management of the Willows of deceiving its prospective patients. The hospital and health board has summoned Dr. Edwin P. Haworth, its superintendent, to appear at the next meeting to answer to the charges. The report also censures a picture showing a large consulting staff of physicians and nurses, only one of whom admitted to the investigating committee any work connected with being on the "staff." Several physicians did not know their names were being used. Sanitary conditions at The Willows, prices charged patients, the high infant mortality there and the management's lax attitude toward condoning morals sins were criticized by the committee. Nine women, it stated, slept in one double room. Two slept in every bed as a general rule. The hospital and health board received the report on the Willows Sanitarium, the Fairmount Maternity Sanitarium, 21st Street and Montgall Avenue, and the Fairmount Maternity Sanitarium, 625 Arlington Ave. The recommendations in all three cases were the same. A resident physician of undoubted standing should be employed on salary and he should have no other financial connection with the sanitarium. A high class nurse should have charge of training schools. The pathologist from the General Hospital should check up the sterility of the operating rooms. The board also discussed the recommendation of the investigating committee that more care should be exercised in allowing babies to be adopted from these maternity sanitariums. New York, Nov 10.--A six-weeks old boy--a waif from Kansas City, Mo.--was the chief actor in a domestic drama, revealed before Supreme Court Justice Gavegan today, that had as its main theme the deception of a wealthy former husband. Confronted by evidence gathered in Kansas City, St. Louis and Hannibal, Mo., Mrs. Lydia Locke Marks admitted that she had obtained the baby under false pretenses and brought him here in an attempt to persuade the husband she recently divorced that the child was hers and that he was the father. Her former husband, Arthur Hudson Marks, millionaire organ and automobile tire manufacturer, was responsible for today's court action, which ended with an order for the return of the child to the Willows Sanitarium in Kansas City. Marks was divorced by Mrs. Marks in September, 1923, when, it is understood, he settled on her $300,000 in cash and placed $100,000 in a trust fund for her. They were married in December, 1917. Mrs Marks, the former Lydia Locke, concert singer, previously had been married to Lord Reginald Talbot of England and Orville Harrold, grand opera singer. Frederick A. Scofield, attorney for Mr. Marks, informed Justice Gavegan that Mrs. Marks often had told her husband after she had instituted divorce proceedings that she was soon to become a mother. She appeared in New York on October 14 with a child and a nurse, and communicated with her former husband and asked him to acknowledge the boy as his own, the attorney said. Mr. Marks, according to Scofield, employed private detectives, who learned that Mrs. Marks had obtained the child in the Kansas City sanitarium by representing herself as Mrs. Ira Johnson, of Hannibal, Mo., and presenting letters which apparently established her as a woman of responsibility. The Willows Hospital, 2929 Main Street, was ordered not to receive any more patients by the hospital and health board today. The action grew out of an alleged disobedience to a ruling recently adopted by the children's bureau of the state board of health regarding hospital to discontinue advertising babies for adoption. The Hospital was charged also with failing to obtain permits from the state and city boards of health. E. P. Haworth, proprietor of the institution, failed to appear before the board when he was asked to do so. When he failed to appear, the board instructed Dr. Herman Pearse, city health director, to write him a letter telling him to stop taking patients until he obtained a city license and permit. Mrs. C. M. James, head of the Veil and Women and Children's hospitals at 2001 East Eleventh street, appeared before the court at its request today and said she would get her permit, which she had not done to date. Mrs. James told the board she had not advertised babies for adoption since the new rule was adopted. Myrle Sizer Is Located. Word From Kansas City Is that the Missing School Teacher Is In Maternity Home There. Cedar Rapids, Ia., Jan. 20 (United Press): The first definite clue to the whereabouts of Miss Myrle Sizer, Mount Vernon School teacher, missing since November 5 when she disappeared from the streets of Marion was received today when authorities at Kansas City, Mo., expressed the belief that she was in a Hospital there.The report from the Missouri City stated that she was believed to be a patient at the "Willows," a maternity hospital, but that all efforts to gain admission and verify the report were without avail. Miss Sizer, a teacher in the public schools at Maquoketa. la., was last seen at the Milwaukee depot--at Marion on the, afternoon of November 5. The first intimation that she had not gone on .a visit to her parents came the following Monday when she failed to report for duty at the school. Following her disappearance, a search was started. And thousands of residents of Linn and .adjoining counties took part in the search. Des Moines, Ia., Jan. 20 (United Press): Positive identification of a girl held in the Willows Maternity hospital at Kansas City, Mo., as Miss Myrle Sizer, missing Maquoketa, Ia., school teacher, was expected momentarily this afternoon -by James Risden,. chief of the state bureau of investigation.According to Risden he has been in communication with Kansas City authorities for several days and the identity of the girl is practically certain. Risden said the girl's father A. C. Sizer, is in Kansas City today and was to go to the hospital to make certain the identification. Mr. and Mrs. T. L. Boatman have adopted a four months old son from the Willows hospital, Kansas City, Missouri.They drove to Kansas City Thursday and returned Saturday with the young man who will be known as Bruce Keith Boatman. REQUESTS FOR BABIES TO ADOPT EXCEED THE SUPPLY HERE As Christmas Approaches, Childless Homes Open Their Doors to Take in Permanently the Little Ones. More babies are sought for permanent adoption in Kansas City this Christmas season than can be supplied by the two principle sources, the Willows and the Fairmount maternity homes. A baby a day, on an average, has been let for adoption by the Willows in the last six weeks, and the Fairmount home could have met that average if it had had enough babies. As it is, the Fairmount has been providing about twenty babies a month for adoption. As Christmas approaches, the demand for babies increases from childless parents. Some of them have been waiting for the right sort of baby for months. "I have the tree, the lights, and the gifts," one woman told Mrs. H. S. Lane, superintendent of Fairmount. "All I need now is the baby.". So strong is the demand for squirming, kicking little Christmas gifts that the babies are seldom more than 2 weeks old before they are adopted at this time of year, Mrs. Lane added. Two-at-a-time adoptions are increasing in popularity, perhaps because of a growing notion that companionship will be an asset in such an upbringing. Only last week a Kansas City woman adopted two 2-week-old infants, Mrs. Lane said. "A child in the home at Christmas seems to complete the picture." Mrs. Lane concluded. At the Evans Children's Home, not a maternity institution, Mrs. Mary J. Weaver last night reported a lively demand for children for adoption. The home last Christmas season provided twenty-six children from 2 to 5 years old for adoption. In the last six weeks eighteen children have been adopted from the Evans home, and a half dozen or more are scheduled for adoption this week. Read about the Willows Maternity Sanitarium in these newspaper articles dated between 1908-1949.